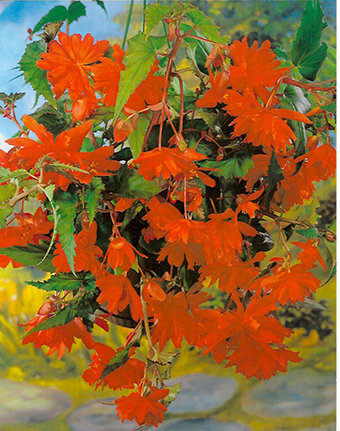 Cascading flowers ideal for baskets, tubs and planters. - Can be planted in pots, containers or hanging baskets. - Alternatively start them off in a greenhouse. - Plant hollow side uppermost, 5cm/2” deep, in well drained soil. - Water regularly during dry periods avoiding wetting the foliage. - Dead head regularly, to encourage new flowering. - Reduce the watering when the leaves begin to yellow, this encourages dormancy. - Lift, dry and store in a frost free dry location, before the first frosts. Please note- one bulb can produce a marvellous display of flowers in a 20cm /8” diameter pot or basket!